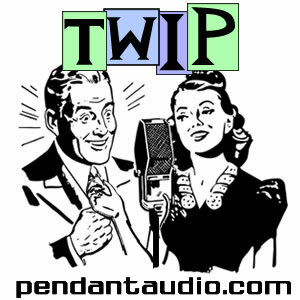 TWIP is a weekly round-up of Pendant's shows, featuring news, interviews, preview trailers and generally more than you probably ever wanted to know about Pendant Productions! The content of TWIP varies and may, at times, contain adult language and themes. 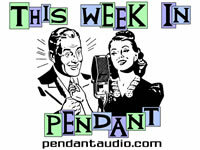 You may submit general Pendant questions at any time, as well as questions for upcoming interview guests. Now accepting questions for actor Jessie Moore! 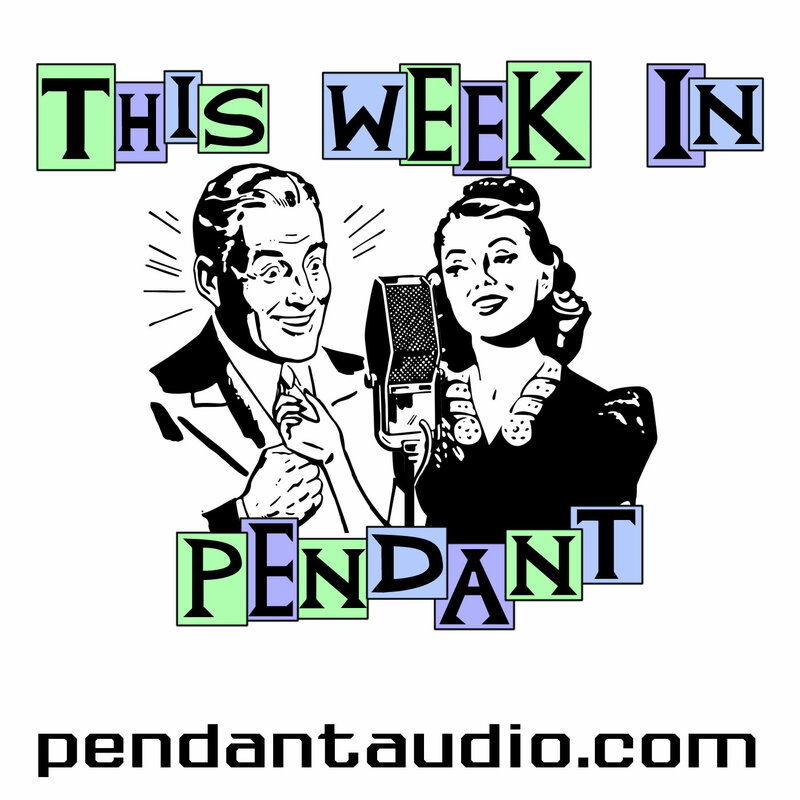 Produced because our members and fans asked for it (I was as shocked as you) and hosted by yours truly and my Co-Executive Producer, Susan Bridges, catch up on all the latest Pendant news and listen to us make fools of ourselves while doing it. What else could you ask for? Don't say money. I'm fresh out. But I might have a few spare toasters. The theme to TWIP is "Mister Exposition" by Kevin MacLeod at Incompetech.com! The TWIP wiki entry, complete with full interview guest lists and summaries! 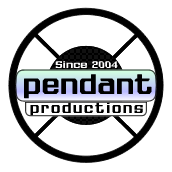 Pendant show "This Week in Pendant" was a finalist in the Best Speculative Fiction Fan or News Podcast (Specific) category of the 2011 Parsec Awards! Do you want your very first taste of "Tabula Rasa"? Because this is where you'll get it! If you listen! So... do that, hey? The "Dixie Stenberg and Brassy Battalion" comic packages have shipped, "Seminar" is getting a new writer, the release schedule has been extended through next year and we are coming to the Mid-Ohio Comic Con in Columbus, OH from Sept. 28-30! Come see us and say hello! The first "Pendant: Backstage" round table discussion will be about "Seminar" scripts and the submission and acceptance thereof, so get your questions in now! We've got the preview trailer for "Genesis Avalon" episode 35 and Jack and Perry Whittle discuss self-directing, absurdity and dreams! Goodby sweet chat, we knew thee too well. OoOoooOhhHh, Mr. Backus! New pilot episodes have been written! Isn't that exciting? Of course it is! But for what? Ahhh, that's the question, isn't it? This time we've also got specifics on the debut of the new "Seminar" theme... maybe? We've got a preview trailer for "The Kingery" episode 6x01, and Jack and Kathryn Pryde discuss asphyxiation, bath tubs and getting heavy! This very show got a new logo! Have you seen it yet? You probably have, so... that's cool. No, I'm sure you love it, you were just too busy to say so. I understand. It's fine. I'm sure you also know "Seminar" is getting a new theme and that we've got news five to six new Pendant shows (counting is hard). Get your first taste of "Macbeth" from "The Pendant Shakespeare" with the project preview trailer, and we've also got the preview trailer for "Genesis Avalon" episode 34 and casting call results for "Seminar"! Jack and M Sieiro Garcia discuss goofing off, Skype and boundary pushing, and you can submit your questions for our next interview guests right now! Who will they be? Found out right in this here episode! Can I finish? TWIP is getting more interactive, but that means you have to interact with us! We can count on you to do that, can't we? You don't hate us, do you? Well good then, all seems in order! 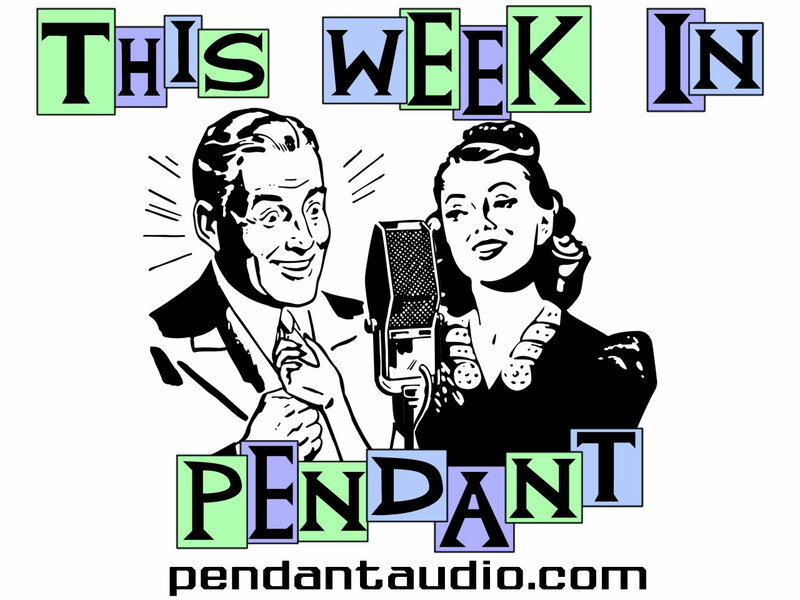 "Genesis Avalon" becomes a Parsec Award finalist, "The Kingery" gets a new theme, "Pendant: Backstage" gets absorbed and AeroQuest Dynamics merchandise (from "Dixie Stenberg and Brassy Battalion") is in the store! We've got preview trailers for "The Kingery" episode 5x12 and "Seminar" episode 46, and Jack and Christopher Stadther discuss medical miracles, having relations and punching yourself in the face. Now with more cricket herding! A Pendulum that got engaged at the Pendant Picnic is now married... and to the person he got engaged to! Isn't that something? We've got news on production progress on our three new in-development shows, and even newer news (is that a thing?) on a fourth! We are just chugging along here folks, so watch out! Get info. on "Seminar" submissions and our show ratings, Pendant's executive producer was on The Fanboy Scoop (at fanboycomics.net), we met Pendant super-fan Jordan (again!) and we read off the names of all the contributors to the "Dixie Stenberg and Brassy Battalion" comic book Kickstarter! We've got preview trailers for "The Line" episode 2x16 (SERIES FINALE!) and "Genesis Avalon" episode 33 (NOT series finale!) and Jack and Rene Christine Jones discuss ripsnorters, being yourself and major issues (we have used a lot of parentheses!). Hey! Do you want news on THREE new upcoming Pendant shows? Well then is this ever the show for you! Find out what they're about, who'll be writing and directing them and all that jazz (jazz not included). "Tabula Rasa" and "The Pendant Shakespeare" get artists, we get a director of marketing, directors settle in and "Genesis Avalon", "Red Sands Investigations", "The Line", "The Pendant Shakespeare" and "Once Upon a Time in Vegas" all get full master quality releases! Who loves you? We do! We've got casting call results for "Tabula Rasa" and "Macbeth", and preview trailers for "Genesis Avalon" episode 32 and "The Kingery" episode 5x11! Jack and Colin Kelly discuss screaming like little girls, creepy laughs and counting to one, and I hope you're prepared... to be info-tained just short of death! Hey look, it's a TWIP! We've changed the drapes, washed the pizza off the walls and scrubbed out those weird carpet stains, so it's shiny and fresh just for you! And boy is there a lot to talk about. "The Line" is coming to an end, but every end leads to new beginnings, and "Tabula Rasa" and "The Pendant Shakespeare" have big casting calls and premiere/return dates in November (YESvember is more like it, am I right?). A donate button makes its first appearance on the site and we have a wiki that needs your help! Oh, our shows need you iTunes reviews, too, which is yet more help you can provide. You are so helpful, it's honestly amazing! Oh, and did you know "Dixie Stenberg and Brassy Battalion," "The Kingery" and "Seminar" now have their full master quality files available on the website and in their podcast feeds? It's true! And there's more on the way. We've got the preview trailer for "The Line" episode 2x15, and Jack Calk and Anna Rodriguez discuss preparation, good English and "Tabula Rasa"! So check your electronular mail, you punks, because it's TWIP time!